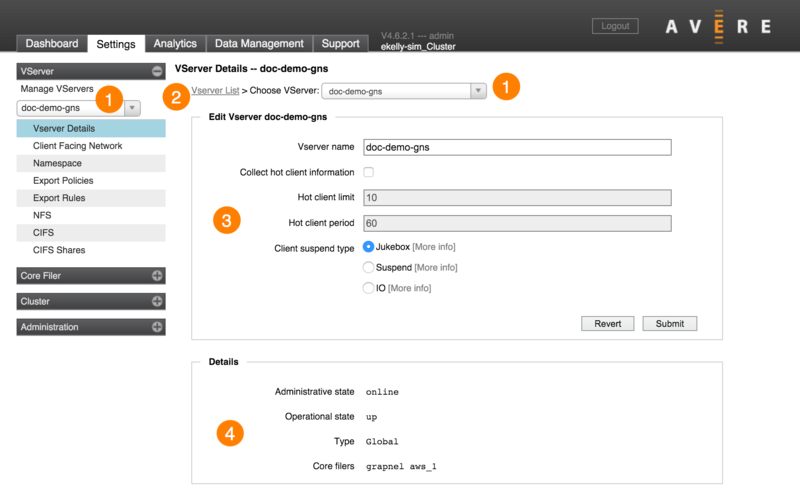 The VServer Details page lets you configure advanced settings for one vserver. The drop-down chooser in the sidebar affects all pages in that section. That is, if you use the bar underneath Manage VServers to select a vserver called GNS-123, and then load any of the pages that require a vserver selection (Vserver Details, Client Facing Network, Namespace, NFS, CIFS, or CIFS Shares), these pages will load with GNS-123 automatically selected. The Details section (4) at the bottom of the page shows current information about the vserver. 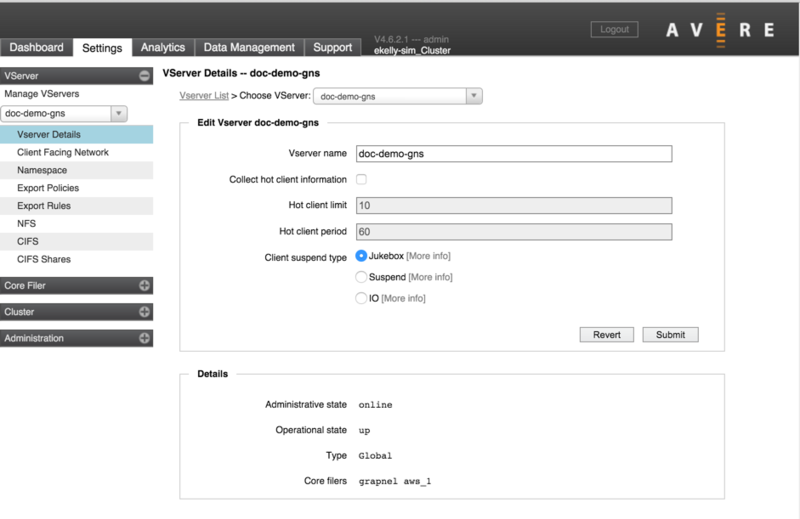 You can use the VServer List link (2) to return to the Manage VServers page. Editable information is in the main section (3). Each option is explained in detail below. You can rename the vserver by editing the VServer Name field. A hot client is a client that generates a disproportionately high amount of demand on the cluster relative to other clients. Collecting statistics on hot clients puts an extra burden on the cluster nodes, so if you do not plan to use this information, leave this setting disabled. To enable hot client collection, check the Collect hot client information box. Optionally, you can customize the other settings in this section. The Hot Client Limit is the maximum number of clients per node to use for hot client statistics. The default is 10, which means that information will be collected for the top ten most active clients on each node connected to this vserver. Hot Client Period is the polling period (in seconds) for collecting information. The default is 60 seconds (1 minute). The system will collect hot client information once during this interval. You also can enable hot file collection from the Dashboard section of the Avere Control Panel by clicking the box in the Clients tab of the status bar at the bottom of the page. Detailed information about hot client statistics is included in Using the Avere Control Panel Dashboard, specifically in the Hot Clients Reporting section of the Clients Status Tab article. This section allows you to customize the type of error messages sent back to clients that access suspended junctions or core filers.